Perched parallel to the City-Ipswich train line, between Auchenflower and Milton Stations, is Milton Park, housing Milton Park Dog Park. Funnily enough I feel like the park has somewhat of a business/commuter atmosphere, with all the necessary amenities suitably supplied but in a very sensible and structured manner, which I think deters frivolity and relaxation; surely the stables of a stroll or gallop in the park? Still the grounds are expansive with sizeable areas of green space, a basketball shooting zone, large children’s playground and parking, as well as the adequately sized dog park. A slightly more unusual feature to the space is the enormous storm water drain that runs along the Eagle Tce side, which, admittedly, is furthest from the playground and parking but reasonably close to the dog park and basketball hoop. It is fully fenced but nevertheless I would proceed with caution. The drain also suggests that this park is not the ideal outdoor haven in the event of severe weather or flooding. The main entry to the dog park is double gated, however the entry closest to the carpark, which is situated off Nerida Lane, only has a single gate. There are also the customary water taps; poo bag dispensers and bins strategically placed, as well as a seat, some trees for shade and an undercover table and chairs. I visited midmorning and it was already quite warm, thus I suspect during the peak early morning and late afternoon times the shade facilities would be stretched so I’d recommend a BYO umbrella. Having said this, I think the size of the fenced space offers an excellent area for the dogs to stretch their legs, interact with other dogs and generally enjoy a bit of controlled freedom. 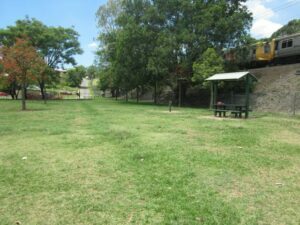 I suspect that many canine-inclusive families would thoroughly enjoy the facilities at Milton Park, certainly the family I met were very content with their surrounds, however for those wanting a more cozy, tranquil dog park I’d recommend Neal Macrossan Park, Paddington. So whether you’re work or pleasure oriented there’s an inner-western dog park the perfect fit for you and your pooch.